Today is Imbolc or Ground Hog Day. What fires will you light on this festival of Brigid, the Keeper of the Sacred Fire? It’s important today to remember to listen to our intuitive selves, listen to the inner wisdom of our intuitive selves & bring the new growth into our lives. In other ancient Celtic Mythology, the Spring Maiden (Olwen, Nawalen, Gewnhyver, Blodeuwedd, Brigid) initiates a young Sun king into a deeply sexual, spiritual experience. 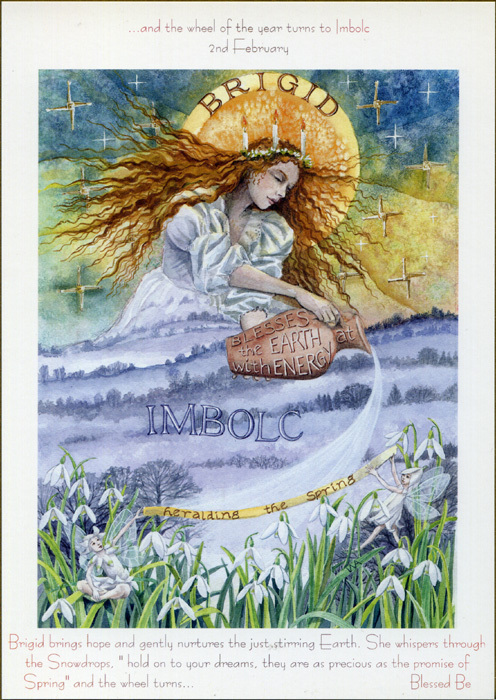 The secret of Imbolc (if there is such a secret!) is hidden within these tales. They hint & suggest at the fertile power of the young female, the power she has of the unconscious, the spark of intuition that lies within us all. It needs to join the active actions of the Sun King as he gains his strength. It’s the union of these two aspects of ourselves & the energy created which brings forth new life, new ideas, growth & manifestation. In Nordic myths, Freya is the Goddess at this time of year (irony, that Imbolc falls on a Friday this year, the day of the week so called because of Freya). These Goddesses are not to be mistaken with the Virgin Mary. The Church took out the aspects of women that they wanted to control, so Mary became a shadow of Brigid, of Freya or any other powerful, sexual Goddess. None of these Goddesses are passive, weak, meek or subordinate. They celebrate their motherhood, they celebrate their complex femininity, the joys & frustrations of motherhood. I created a little Tarot spread for you to embrace your Goddess side, no matter your gender. We all have the aspects of the Maiden & The Sun King within us, it’s the Maiden aspect we’re going to be looking at with this spread. 1/ What have I forgotten that I need to reclaim? I wouldn’t have said that the 9 of Cups is something I need to reclaim, though when you look at this rendition of it, this isn’t the happy, perhaps drunk barman, this is the self-healing, being happy in your own skin, being soulful happy within yourself. That is, according to the cards, what I need to reclaim. 2/ What do I need to invoke at this time? I’m going to quote something I’ve been remembering from Dame Helen Mirren here. Perhaps not so much aimed at the kids, but certainly need to use it slightly more often. I can be direct (those that know me, know I don’t mince my words!) but I’ve been holding back on what I’ve been thinking. I’ve been filtering things. The Knight doesn’t filter things. He’s not got the skills; not yet. 3/ What’s my inner fire opportunity? The 9 of Stones is about healing – about battling the inner demon that I know is there; it’s about balancing out that demon & not feeding it. I’ve been feeding it too much last year, time to feed the other “hound” & not let the bad wolf win. 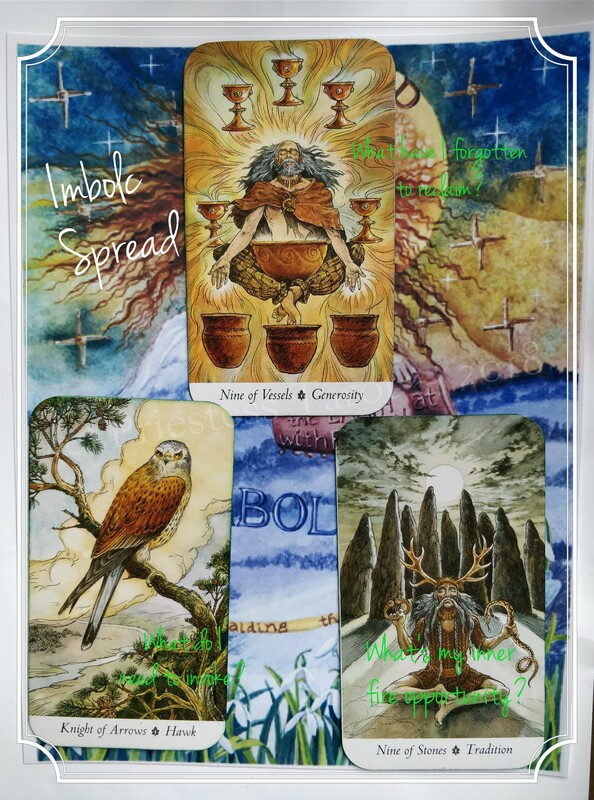 This Imbolc (until the Spring Equinox) I personally, need to work on my spiritual self, my temper, how I say things & stop feeding the bad wolf. We all feed the wrong wolf from time to time, but now I need to start feeding the right one. It’s got to be a conscious decision. Which, now I know, I can do. That’s the beauty of the Tarot & it’s visual representation. It’s not hard to do the work you need to do in life. Knowing that you’ve got to do it is often half the battle. The other half is actually doing the work. I’ve never been one to shy away from work, self-improvement. I get on with things. Not everyone does though. That’s the trick here with the Tarot. It points out things you could be doing better, things you really ought to avoid doing & then it’s down to you, in the saddle of the horse of life, to go in the direction that benefits you. Some may hold you back, some may actually try to help you. If you’d like me to draw your cards & help you find the answers you need in my rather open & honest way, you can book your consultation right here. *Candlemass is the Christian Church’s name for this festival.